It was a delight to visit Bradley Hutchinson’s pristine letterpress shop the other day to view the printed map page for Catherine Docter’s new volume The Village Churches of Santiago de Guatemala, 1527—2010. The book, designed by Hutchinson, includes silver gelatin prints, hand-colored plates of church facades, text by Catherine Docter, and one map that I’m pleased to have produced. 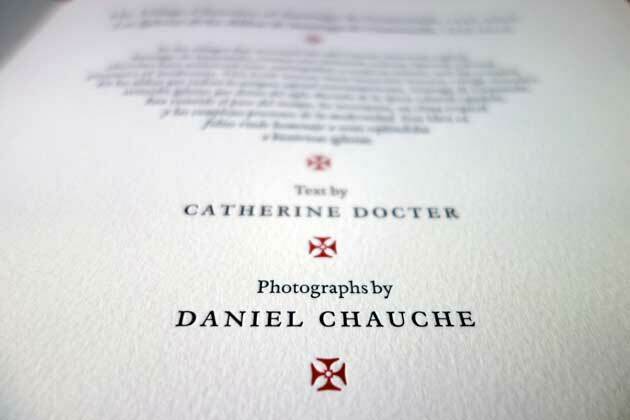 Working with Bradley—even on a small project—yields welcome lessons in the history of type and book design, history and techniques of letterpress printing, and bonus travel tales and tips. Bradley selected the beautiful Espinosa Nova typeface (check out that “QU” ligature!) and guided me in choosing line weights and ornaments suitable for letterpress. I designed the simple, hand-drawn map frame based on sketches I’d made of a fresco detail inside La Merced de Antigua a few years ago. The compass rose was inspired by a historic Central American map detail that Catherine sent me. After inking and scanning the final version of the map, I zoomed far in in Photoshop, opened up the lines of the river, and made sure there were no stray ink marks around all those hachures indicating the volcanoes. 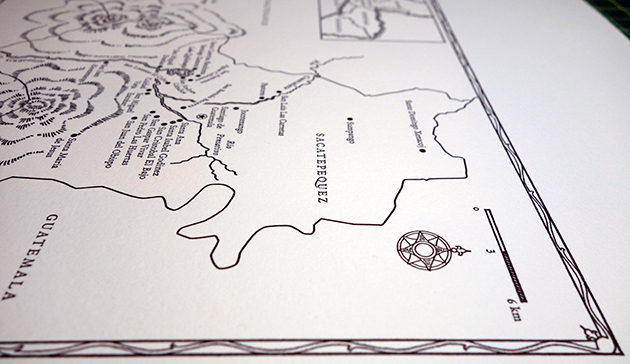 The map printed beautifully and the book is going to be gorgeous. Please contact me if you’re interested in this fine edition and I will gladly put you in touch with the distributor.